My name is Scott Stevenson. I moved to Utah in 2011 after graduating from Boise State University with a Bachelors in Health Science. I had plans to get an MBA and work in hospital administration, but was swept up by the outdoors. Growing up in Idaho, I have always loved backpacking, hiking and trailrunning, but Salt Lake City opened up an entirely new realm of outdoor activity. What started out as backpacking and hiking has quickly transformed into mountain climbing, rock climbing, traveling, backcountry snowboarding and snowboard mountaineering. Not too long after moving to Salt Lake, I became hooked on being in the mountains. I was transformed into a completely new person and all I wanted to do was experience nature as often as possible. I began a goal to climb the 50 state high points, and after a few steep exposed peaks I began sport climbing and worked my way into traditional climbing in order to improve my skills as a mountain climber. I traveled out of the country and climbed mountains. I traveled within the country climbing classic routes. 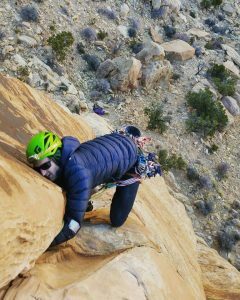 I stayed in Salt Lake and worked on improving my alpine climbing abilities, increasing my physical capabilities and learning new skills for the mountains. The past two years especially I have been working on being a leader in the mountains. I have strived to educate and train myself in such a way that I feel confident in risk management, weather assessment, terrain navigation, rescue and leadership. I recently finished graduate school, receiving on a Masters of Science in Public Health. The eventual goal is to be able to combine work, travel and adventure and make difference in the world of Global Health. Currently, I am working as a web developer and just moved to Sugarhouse with my girlfriend Kim. We are both working on improving my skills in all types of rock climbing. I recently sent my first two 5.12 sport routes (Naked Nedbula / Liquid Oxygen) and my first 5.11 trad route (Stiffler’s Mom). Even though the crux was bolted I still feel pretty good about it. Click Here to view more of my notable outdoor accomplishments.